It’s pretty evident the Apple Pencil is one of the cornerstone strengths of the iPad platform. So many of Apple’s marketing videos showcase the potential of the Pencil in a creator’s hand that you might be surprised a Pencil doesn’t come bundled with an iPad purchase. Now that Apple has put Pencil support into the education-focused 2018 iPad, you can rest assured the Pencil as an input device is here to stay for the long haul. Aside from Apple’s own leather sleeve with a built-in Pencil holder, there’s no good way of toting that Pencil around. Actual, real pencils (you know, the ones with lead in them) can be thrown into a bag, lost, chewed on, stepped on, or snapped in half, and you’re good to go for your next art assignment. But the Apple Pencil? That’s a lot of tech to snap in two at the bottom of your bag. 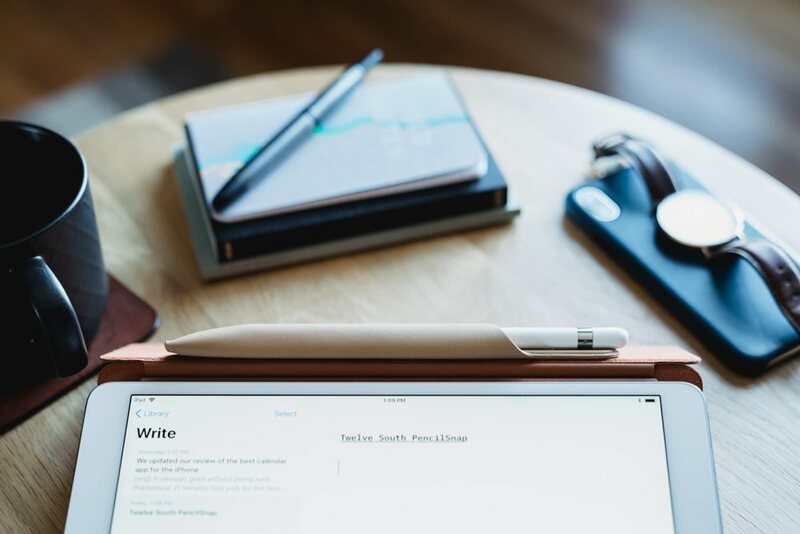 Enter PencilSnap, one of Twelve South’s newest accessories for the iPad and the Apple Pencil. PencilSnap is designed to keep your Pencil available at all times, while still looking sharp. 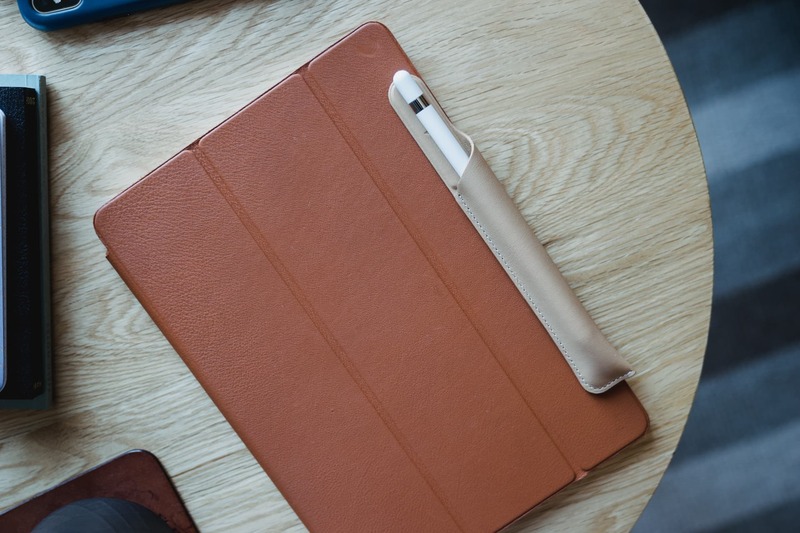 The PencilSnap inherits many of Twelve South’s leather design habits and fits right alongside the SurfacePad. They’re both cut from the same type of leather and both have the same buttery-smooth feel. The PencilSnap has a few debossings to ensure you know it’s a Twelve South product, and the white border stitching adds an elegant touch. Aside from that, the PencilSnap is nothing more than a simple leather sheath with a few magnets packed inside. 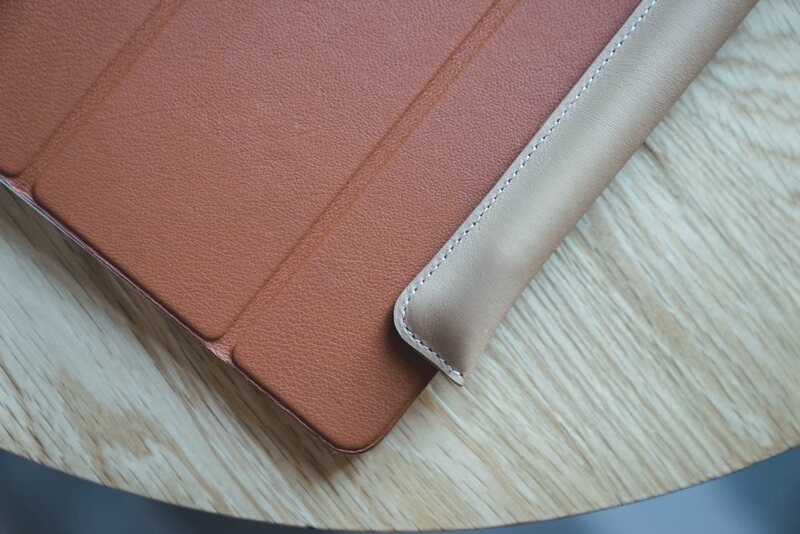 I really like Twelve South’s camel-colored leather. The camel brown leather matched with white stitching is one of my favorite leather looks and should fit just about any work attire or environment. The camel brown plus Apple’s saddle brown is somewhat jarring, but I don’t mind the color combination. Throw in a “Cosmos Blue” iPhone X case and you’re sure to get a raised eyebrow when you empty your messenger bag first thing in the morning. Those magnets are fundamental to why I believe the PencilSnap is worth its weight in gold (or green). 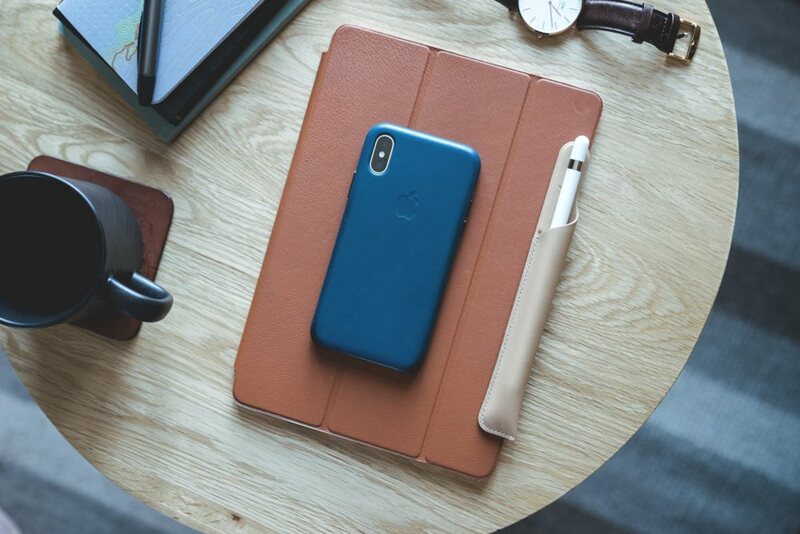 The PencilSnap adheres to the magnets built into Apple’s Smart Cover — or the magnets built into the SurfacePad — ensuring the PencilSnap hangs along for the ride. So far, I’ve yet to open my bag and find the PencilSnap unattached and laying at the bottom of the bag. The magnets adhere firmly to the Smart Cover and even more so to the SurfacePad. I just gave the Smart Cover + PencilSnap a good shake to see how much force it took to remove the PencilSnap, and I’m pleased to announce the PencilSnap let loose after a near-uncomfortable level of shaking. This thing isn’t going anywhere. 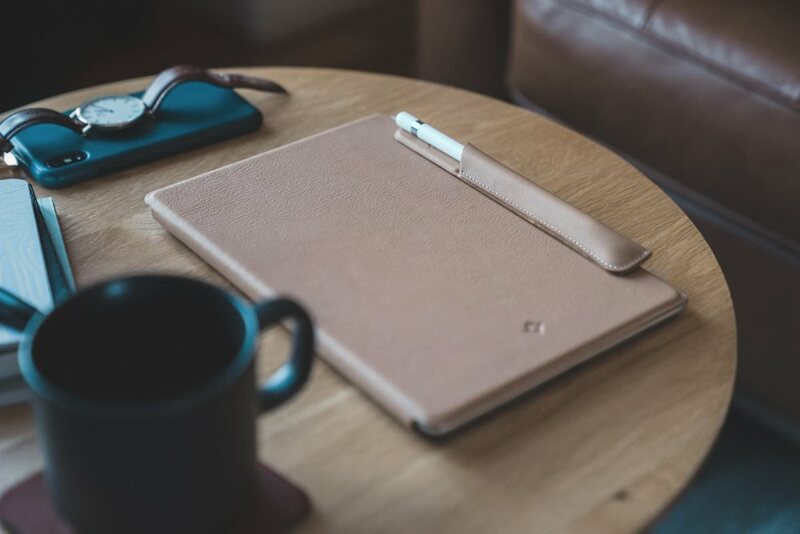 When combined with Apple’s Smart Cover, there’s one nicety provided by the PencilSnap that’s somewhat uncharted on Twelve South’s site. If you fold the Smart Cover over to prop up the iPad for typing, the PencilSnap sits right at the top of the screen, perched and ready to go at a moment’s notice. It’s not entirely different than laying the Pencil at the top of the screen and adhered to the iPad’s internal magnet, but this is more elegant and far less likely to slide down your screen mid-sentence when you’re typing. In my experience, the only drawback to the PencilSnap experience is having to break it in. For one, my PencilSnap leather is a bit tacky, making sliding the Pencil in and out of the sheath far from smooth. To get around this, I pinched the PencilSnap to open the leather opening a bit, which helped monkey the Pencil inside. Getting the Pencil out has also been somewhat tricky — again, I’ve had to bend and pinch the leather to remove the Pencil from the PencilSnap. I thought I was going to break the Pencil the first time I tried to remove it. 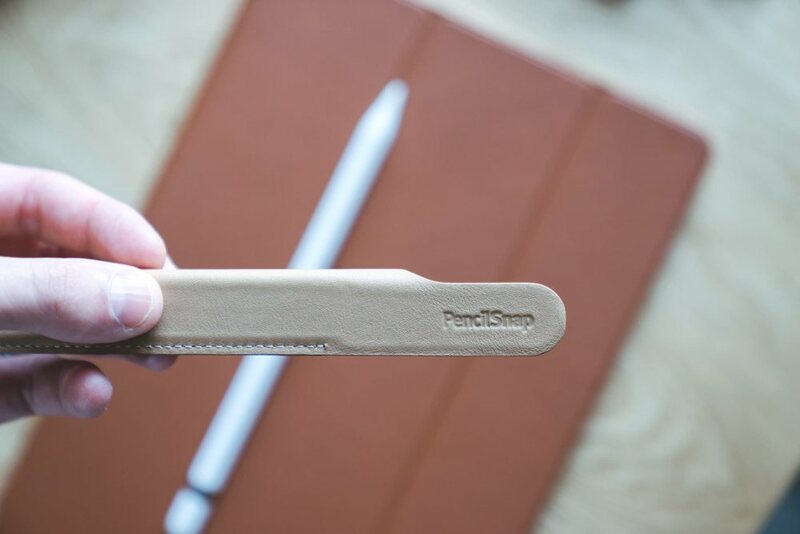 Rest assured, the PencilSnap just needs a little massaging before it’s a smooth experience. After the short break-in time, you won’t need to worry about any extra strain put on the Pencil during removal. If my research is correct, you won’t find many other good quality leather Pencil cases for £24.99. At £29.00, Apple’s own Pencil Case comes in a variety of colours, but doesn’t have magnets for adhering to a Smart Cover. These magnets, plus Twelve South’s impeccable leather colour taste, make for an easy recommendation at the £24.99 price point. 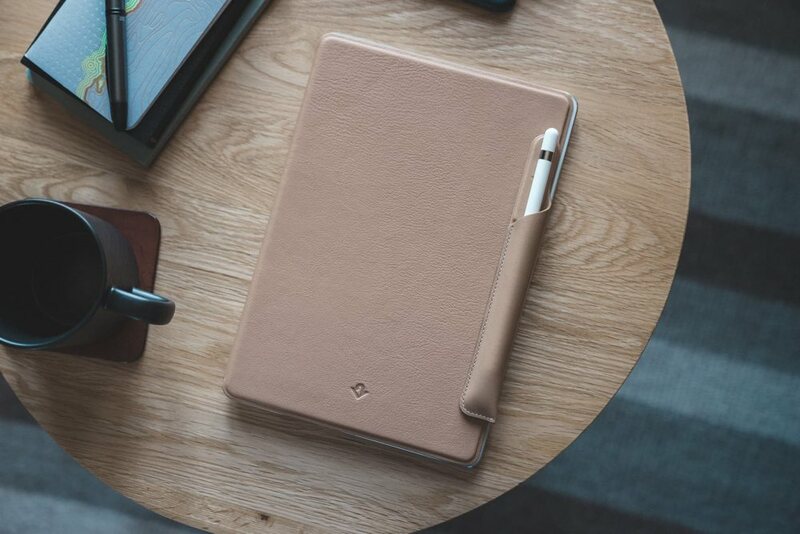 No matter which colour Smart Cover or SurfacePad you own, the camel PencilSnap is sure to look good and be along for the ride when a moment of creativity sparks. After a little massaging, the PencilSnap will become one of those quick and easy fixes for carrying around the technology-filled Apple Pencil — an otherwise mundane problem. You can purchase the Twelve South PencilSnap on Amazon.